Scroll through our Contract List below to find the contract that you need. If you require assistance, call us on 011 783 8017. The Contract List below contains all of the automated contracts that are available at Contractzone. We also offer contracts that are drafted by our expert panel of experienced attorneys. An acknowledgement of debt is a document whereby a debtor unequivocally admits liability to a creditor for a certain amount of money, and undertakes to repay the outstanding amount on terms agreed to between the parties. An acknowledgement of debt is also a liquid document, which is a particularly useful document that may be used to expedite the litigious process by a creditor, should it become necessary. This is an important document on our Contract List. The cost of this document R375. An acknowledgement of debt is a document whereby a debtor unequivocally admits liability to a creditor for a certain amount of money, and undertakes to repay the outstanding amount on terms agreed to between the parties. An acknowledgement of debt is also a liquid document, which is a particularly useful document that may be used to expedite the litigious process by a creditor, should it become necessary. This acknowledgement of debt includes a comprehensive AOD, in terms whereof a third party guarantees the obligations of the debtor. The cost of this legal agreement is R375. This Free Legal Contract provides you with a framework for your affidavit. Getting Married Soon 😬 What is yours is yours and what is your spouses is his or hers. You have separate estates and don't participate in any growth in the estate of your spouse. When the marriage ends, whether it is by divorce or death, each of the parties retains her assets. This ANC requires registration in the Deeds Office. The cost of the document itself is R950. Getting Married Soon 😬 The accrual system allows parties to share in the growth in their estates during the marriage. So, each party lists the commencement value of their assets on the marriage date and at the end of the marriage, they share in the growth during the period of the marriage. The regime is flexible, allowing parties to also exclude assets from the calculation of the accrual. This free document is an information sheet to be completed by a prospective tenant of a residential property. Go ahead - register and generate this document at no charge at all. Is your turnover more than R10 million but less than R50 million? Do you have a minimum of 51% Black ownership. Under the new BEE codes, an entity that has more than 50% Black ownership and that has a turnover below R50 million is a Qualifying Small Enterprise. If the Black ownership is 100%, the enterprise qualifies as a Level 1 B-BBEE status. If the Black ownership is more than 50% then the entity qualifies as a Level 2 B-BBEE status. Completing the prescribed affidavit on Contractzone is a simple process, taking less than 3 minutes to complete. Under the BEE codes, the affidavit is all that is required. This is one of our Free Legal Contracts. It will set out the terms and conditions for the purchase or sale of a Vehicle. This cession of contract should be used where the rights and obligations of one party (the cedent) under an original or pre-existing agreement needs to be ceded or transferred to another person or entity (cessionary). Upon concluding this agreement, the cessionary would be entitled to claim any benefits that were owed to cedent in terms of the original agreement. The most common reasons that give rise to the conclusion of a cession of contract include security for a debt, the transfer or sale of a business or corporate restructuring. At a fraction of the normal cost (R275) you can now acquire this fully compliant cession. You will receive it both pdf and word format for your future use. A cession of book debts contract records the agreement to cede or transfer claims for payment of money that is either owing or may become due and owing in the future to a creditor (cessionary). This agreement should be considered for use where a creditor requires additional security from a debtor or a debt that is or may become owing. Do not wait until it is too late to protect your business against bad debts. At a fraction of the normal cost you can now acquire this fully compliant cession. The cost of this legal agreement R475. You will receive it both .pdf and .doc format for your future use. If you are co-habiting you absolutely must conclude a Cohabitation Agreement, it is one of the most important Personal Legal Documents. Generally, people take the trouble to get an anti-nuptial contract prepared before they get married. However, by and large, people cohabit without taking the trouble to sign a cohabitation agreement. If the relationship ends, the disputes between parties that co-habit is often more complicated than couples who go through a divorce. Central to cohabitation arrangements is the immovable property where the parties choose to live. It may be a property acquired by the parties jointly, or, it may already be owned by one of the parties. Lastly, either one, or both of the parties could lease the property from a third party. A commercial lease agreement is a contract entered into between a landlord and a business setting out the terms and conditions upon which the landlord is prepared to rent the subject property to the business. This commercial lease is specific to renters intending to utilize a property for business or other commercial purposes. At a fraction of the normal cost you can now acquire this fully compliant document. The cost of this contract is R475. It is prepared by an experienced panel of lawyers, and available at a fraction of the normal cost. Are you appointing a Consultant? This agreement provides for the appointment by a company of a third party to provide consulting services. The agreement provides for the protection of both intellectual property and confidential information, payment terms, breach provisions, limitations on liability, etc. At a fraction of the normal cost you can now acquire this fully compliant agreement. The contract costs R475 and can be completed in under 10 minutes. In the business of supplying goods or services? Get started with this flexible contract incorporating generally accepted trading terms and conditions for a individual or company supplying goods and/or services to its clientele. This document encompasses provision for payment, delivery, cancellation, limitation and other necessary legal requirements. This document also includes a deed of suretyship that may be signed by the customer representative entering into the agreement. Importantly, this document is fully compliant with the National Credit Act, 2005. 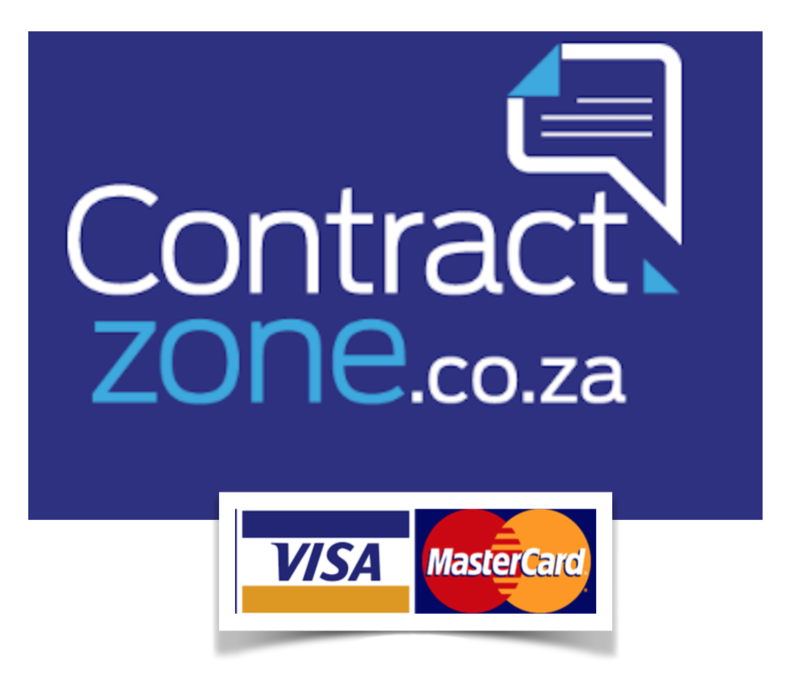 90% of credit application forms reviewed by contractzone.co.za were found to be defective. Ensure that you are part of the compliant 10%. By doing so, you give your company the best shot at collecting on its accounts, and, in avoiding unnecessary and expensive legal costs. At a fraction of the normal cost you can now acquire this fully compliant credit application form, suretyship and terms and conditions. In the business of manufacturing products? Get started with this flexible contract incorporating trading terms and conditions for a company manufacturing business. This document encompasses provision for payment, delivery, warranties, cancellation, limitation and other necessary legal requirements. This document also includes a deed of suretyship that may be signed by the customer representative entering into the agreement. This agreement costs R475 and can be completed in under 10 minutes. If you have any questions once you have completed the process - call us - we are here to help you and ensure that you have get the right legal document. Get started with this flexible contract incorporating trading terms and conditions for a transport company. This document encompasses provision for risk in the transported goods, payment, cancellation, limitation and other necessary legal requirements. This document also includes a deed of suretyship that may be signed by the customer representative entering into the agreement. Get started with this flexible contract incorporating trading terms and conditions for a business operating in the printing industry. Get started with this flexible contract incorporating trading terms and conditions for aFreight Forwarding & Clearing Business. The terms and conditions applicable to a freight forwarders and clearing agents business activities are really important. In the absence of properly formulated terms and conditions a freight forwarder runs serious risks, including the common law responsibilities that apply to common carriers. . Appointing an exclusive distributor for your products? This distributor agreement is suitable for any business that wishes to appoint an exclusive distributor to buy and then re-sells certain goods for his own account within a specified territory. At a fraction of the normal cost you can now acquire this fully compliant agreement. Hiring an expensive new sales resource in a senior position? This agreement costs R475. The agreement is provided to you in pdf and word format, so you can use it again at your convenience. This agreement can be completed in under 10 minutes. If you have any questions once you have completed the process - call us - we are here to help you and ensure that you have get the right legal document. This agreement costs R475. The agreement is provided to you in pdf and word format, so you can use it again at your convenience. This agreement can be completed in under 10 minutes. If you have any questions once you have completed the process - call us - we are here to help you. You know its the law that this contract must be signed? Make use of ourFree Legal Contracts to secure your position. It will give you peace of mind that you have a fair and binding deal with the contractor appointed to paint you home (or a portion thereof). This is a standard agreement whereby a company (or guarantor), guarantees payment of a contractual debt to a creditor on behalf of a principal debtor. In essence, payment guarantees are financial commitments that require the guarantor to make a repayment based on the terms outlined in the original contract. At a fraction of the normal cost you can now acquire this fully compliant payment guarantee. The document costs R375. You will receive the guarantee in .pdf and .doc format for your future use. This is a standard agreement whereby a company (or guarantor), guarantees payment of a contractual debt to a creditor on behalf of a principal debtor. In essence, payment guarantees are financial commitments that require the guarantor to make a repayment based on the terms outlined in the original contract. Do not wait until it is too late to protect your business against bad debts. You will receive the guarantee in both .pdf and .doc format for your future use. A Joint Venture agreement can take the form of an incorporated JV, or an unincorporated JV. The difference is important. An incorporated JV is a separate company that is formed for the specific purpose of the Joint Venture. The Joint Venture Agreement for an incorporated JV must have all of the essential ingredients of a Shareholders Agreement, including a Memorandum of Incorporation. The unincorporated JV is essentially a partnership between two parties. This free document provides a letter of demand to a debtor, incorporating provisions required under section 129 of the National Credit Act, 2005. This document on our Contract List is 100% free. This free document is a living will providing instructions regarding your medical treatment. It is a heavy topic, but if you are serious that you don't want to be a burden on your family if you medical condition is incapable of being resolved, then you need to carefully consider completing this free document and placing it in the hands of a trusted friend or family member. This loan agreement regulates the granting of a loan by one person to another. The agreement provides to the user to input important information such as repayment dates, interest rates, etc. It is important to note that if interest is payable from day 1 of the loan, then it technically falls within the ambit of the National Credit Act, 2005. Please feel free to call us to discus this further. Also, if the loan is to an individual or a qualifying company, CC or trust and the quantum is more than R500,000, then the party granting the credit may be required to register as a credit provider in terms of the National Credit Act. It is a vitally important aspect to comply with. Again, if you are not sure, please call us. The cost of this agreement is R775. You can make payment online through the secure paym8 payment gateway and then go ahead and complete the document. You will receive the final product in word and pdf format. If you require any assistance in this process, please do not hesitate to contact us. As with all contracts on our Contract List you will receive the guarantee in both .pdf and .doc format for your future use. This agreement provides for the appointment by a company of a third party outsourced manufacturer. The parties are required to set out their service levels and manufacturing specifications, standards and instructions in annexures to the agreement. The agreement protects that party that appoints the manufacturer against any issues that may arise in regard to the intellectual property rights in the product. The manufacturer is also precluded from approaching the customers of the party that appointed the manufacturer directly. In addition to the protection of IP, the agreement also provides for the consequences of a breach of the agreement and the parties are able to determine the limits on their respective liability to the other party. The agreement is provided in word and pdf format, allowing the user to edit and re-use the agreement. This mutual termination agreement is based on a consensual retrenchment process. A non-disclosure agreement (confidentiality agreement) is an essential tool that allows a company or an individual to explore business or employment potential before entering into any agreement. This document protects a party`s trade secrets and confidential information that may be exposed during the negotiation phases. Importantly, this agreement protects disclosures that may be made by either party to the agreement. Do not wait until it is too late to protect your business against the loss of intellectual property, including confidential information. This document costs R475. Generate the document in minutes and demonstrate you are serious about your confidential information. Time to get your business affairs in order? Intending to hold Shares as security? If you are intending to take a pledge of shares, you need this document. The document provides for the holding of a creditor of shares as security for a debt. The physical shares must be delivered to the creditor in order to complete the process. This contract costs R375 and can be completed in under 10 minutes. You get the document in word and pdf format. If you need any assistance in completing the document, give us a call. We are here to help. This free Power of Attorney authorises a third party to look after your affairs and to sign documents on your behalf. A restraint of trade is an agreement between an employer and an employee, or may be incorporated as a provision in an employment contract, that restricts an employee from being employed by, establishing, engaging or being associated with a business in competition with the employer following termination of employment. This agreement protects an employer`s confidential information and prohibits an employee from using any of the employer`s intellectual property to the detriment of the employer. It is important to note that restraint of trade agreements are not invalld (as is often thought) are, in fact, valid unless a Court finds that they are contrary to public policy. Do not wait until it is too late to protect your business against rogue employees. At a fraction of the normal cost you can now acquire a restraint of trade. A residential lease agreement is a contract entered into between a landlord and an individual setting out the terms and conditions upon which the landlord rents the property to the tenant. The lease regulates important aspects, including the tenant`s obligation to maintain the property and to restore the property to the landlord on completion of the lease in the same condition as at the commencement of the lease, fair wear and tear excepted. The lease provides for the payment of a deposit by the tenant, which can be applied to fixing aspects of the property that the tenant has neglected (and toward arrear rentals). The document also includes an application to lease, which provides for the submission of important information by the tenant. You cannot afford to not have a properly documented lease agreement concluded with your tenant. The cost of this agreement is R475. This is a comprehensive agreement regulating the sale of a business. You receive the complete document in word and pdf format. The agreement provides for zero rating for Value Added Taxation, based on both entities being registered VAT Vendors and on the business being a going concern on the date of the transfer. In addition, the agreement includes a restraint of trade, which precludes both the seller and a representative of the seller from competing with the business sold. It is important to note that restraint of trade agreements are not invalid (as is often thought). Restraints are in fact and enforceable valid unless a Court finds that they are contrary to public policy. In the context of the sale of a business, the restraint would typically be quite strong. A suretyship is also included, on the basis that the representative of the seller provides a guarantee of the obligations of the seller (often the seller is an empty shell after the sale of the business, leaving the purchaser with a worthless claim against the seller in the event of a dispute regarding the transaction). The user is required to select whether the sale will be advertised in terms of Section 34 of the Insolvency Act. The agreement also covers: stock in trade, warranties, arbitration and the transfer of employees. Selling the shares in your business? This is an agreement regulating the sale of shares in a company. The agreement covers the terms of payment, loan accounts, warranties and also provides for an arbitration to be held in the event of any disputes arising. This particular agreement does not include a restraint of trade, however a separate restraint of trade should be considered (which can be acquired on contractzone.co.za). The inclusion of a restraint of trade in this agreement ensures the protection of the goodwill of the business, as well as the interests of the purchaser, by preventing the seller from being involved in a competing business within a specified territory and for a defined time frame. It is important to note that restraint of trade agreements are not invalid (as is often thought) but they are, in fact, valid unless a Court finds that they are contrary to public policy. This sale of assets agreement is a standard contract recording the agreement between the seller and the purchaser for the sale of certain specified assets. This agreement makes provision for the sale of the moveable property in their current state or condition. This agreement regulates the terms and conditions relating to payment and delivery of the assets so sold. At a cost of R475 this document is a small price to pay compared to the value of your asset. This is an agreement whereby a company has agreed to appoint a sales agent in order to represent the company in the sales of certain products within a certain territory, without giving rise to an employment relationship between the parties. This agreement sets out the obligations of the sales agent in promoting, marketing and distributing the products and its remuneration in so doing on a a commission based structure. This agreement also make provision for the protection of confidential information and trade secrets. You will receive the completed document in both pdf and word format for your future use. This flexible service level agreement is suitable for contracts entered into between a service provider and the end user that defines the level of service expected from the service provider. This agreement serves to define exactly what the customer will or expects to receive from the service provider. At a fraction of the normal cost (R475) you can now acquire this fully compliant SLA. The Companies Act 2008 provides that certain provisions of a shareholders agreement are invalid if they is inconsistent with either the Companies Act (2008) and/or with the Memorandum of Incorporation (MOI) of the Company. This makes it vitally important to prepare the Memorandum of Incorporation and the Shareholder Agreement together, so that they are entirely consistent. If you have an outdated shareholder agreement, it is important to note that it needs to be updated to address changes that arise out of the 2008 Companies Act. If you do not have a shareholder agreement, this is the perfect place to start. Apart from technical compliance with the Companies Act, a valid and binding shareholders agreement is fundamentally important. Disputes that arise between shareholders and directors have the ability to destroy companies. The shareholders agreement (and MOI) regulates the relationship between shareholders themselves, as well as between shareholders and the company. One example illustrates the importance of a shareholders agreement - if a shareholder that is a natural person dies - in the absence of a binding shareholder agreement and an MOI that is consistent with the shareholders agreement - there is enormous scope for disputes. A proper shareholders agreement reduces this risk. Of course the shareholder agreement and MOI covers a vast amount of additional ground. This is an agreement to subscribe for shares in a company. This is an agreement regulating the repurchase by a company of its own shares. The complete document is provided to you in both word and pdf format. An often used structure for the sale of shares involves a share buy back by the company from the "seller" and a new subscription by the "purchaser" for shares, so as to avoid capital gains tax. The agreement covers the terms of payment, risk and ownership, compliance with the Companies Act 2008 and also provides for the resolution of disputes by way of arbitration. This agreement regulates the supply of products by a company to a customer over a period of time. The agreement regulates the terms and conditions of the supply, including the duration thereof, pricing, payment provisions, forecasts and deliveries. The agreement also deals with breach, limitations on liability and similar matters. A suretyship is a form of personal security in favour of a creditor, whereby an individual (as surety), in his or her personal capacity, agrees to a creditor of another (the principal debtor) that it too shall be bound to the creditor for the liability and performance of all of the obligations of the principal debtor in instances where the principal debtor fails to do so. Should you be considering or required to stand as surety for another party, it is of paramount importance that you first acquaint yourself as to the identity of all the parties involved, the period for which you would be liable for the obligations or liability of the principal debtor, as well as the nature and extent of those obligations. Suretyships granted by Companies must comply with the Companies Act 2008, and in particular, section 45 thereof. This document is fully compliant. At a fraction of the normal cost you can now acquire this fully compliant surety for R375. You will receive it both .pdf and .doc format for your future use. At a fraction of the normal cost you can now acquire this fully compliant surety (in both .pdf and .doc format). The cost of this item is R375. If you are the owner of a Truck, or Motor Vehicle, and you are leasing the Vehicle to a third party, then this is the agreement that you need. This is a free letter to be sent to your customers setting out the process that will apply if the company changes its bank details. A Will is a legal document indicating how your estate should be distributed and who shall benefit from it upon your death. This particular document indicates that the testator`s entire estate should be bequeathed to his or her children. A Will is a legal document indicating how your estate should be distributed and who shall benefit from it upon your death. This particular document indicates that the testator`s entire estate should be bequeathed to his or her surviving spouse. A Will is a legal document indicating how your estate should be distributed and who shall benefit from it upon your death. This particular document indicates that entire estate of the Testator should be bequeathed to his or her surviving spouse, failing which to the children of the marriage. You can register for a package (below), giving you unlimited access to our entire range of contracts, or you can purchase an individual contract. Download your tailor-made legal contract in Word & Pdf format. Get Unlimited Access to our entire database of contracts for R599 per month. All contracts are provided to you in Word and Pdf format. We aim for a win win. If you aren't entirely satisfied with the product, you can cancel without any penalties. We are a proud member of the Metrofile Group of Companies. If you haven't found what you are looking for on our individual Contract List, you can either search by Category below, or give us a call. We also prepare custom drafted contracts.